For a great many people, traveling and photography go hand in hand – it’s a match made in artistic and educational heaven. Taking beautiful pictures to document your trips is one of life’s little joys – even if you’re not quite at National Geographic or Pulitzer prize level. The problem is, if you’re chasing the really professional images, you’re going to need to pack a lot more muscle than a simple point and shoot. And that means taking up a lot of space with precious and expensive equipment. Equipment that, unfortunately, has a tendency to get damaged very easily. If you’re planning on taking some top-quality camera kit with you on your next adventure, you’re going to need a top-quality packing solution to protect it. Particularly if you’re going to be on the move. That’s why I’ve compiled this review to discover the best camera backpack for travel. And below my picks, you’ll find a handy guide to all the features and functions you need to look out for when choosing your preferred style. 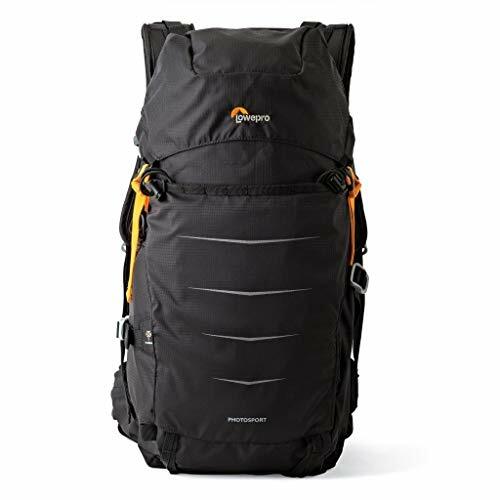 What is the Best Camera Hiking Backpack 2019? What Should the Best Camera Bag for Hiking Include? So, let’s get started and hopefully you’ll find your new camera companion somewhere among this selection. One final word to note – unless otherwise stated, all these bags come with the option to carry a tripod externally. Arguably the most important piece of kit outside the camera itself, so you don’t want to leave that behind. I’ll kick things off with this sling backpack for mirrorless and DSLR cameras. Its compact design is really appealing. It holds your camera and up to two lenses in the main compartment, but there’s more space for an extra lens and other equipment throughout its construction. It could well be the best camera sling bag for hiking – and it’s really affordable too! Not suitable if you’ve got lots of equipment. I really like this pack as an entry-level hiking camera bag, or for those who really need to stay light and agile while on the go. It is water resistant, but it might need an extra cover just to be on the safe side. Just to give you another sling-style option (because I’m nice like that) there’s this offering from Qipi. It’s a little larger than the Altura version, and it does have the added advantage of including a built-in waterproof rain cover. However, its larger main compartment seems to be the trade-off for not having extra lens section down the side. I never said the choice would be easy! The built-in rain cover is a welcome addition. Extra thick padding for protection. Not much space for anything else. It’s a toss-up between these two sling-style bags as there’s not much to choose between them. But with the rain cover included, the Qipi entry just might swing it. Moving on up to the traditional backpack style first brings us to this number from G-raphy. It’s a laptop and camera design that can hold all your electrical items safely in its weather resistant housing – but there’s also a rain-cover if you’re caught in a downpour. There’s plenty of space for you to mix and match lenses and cameras in customizable divider walls. Doesn’t look like a camera backpack. Might not stand up to rigorous use. For the price, this is a great option for an amateur photographer, or someone just starting out in the hobby. More skillful shooters might want to kick it up a nickel though. 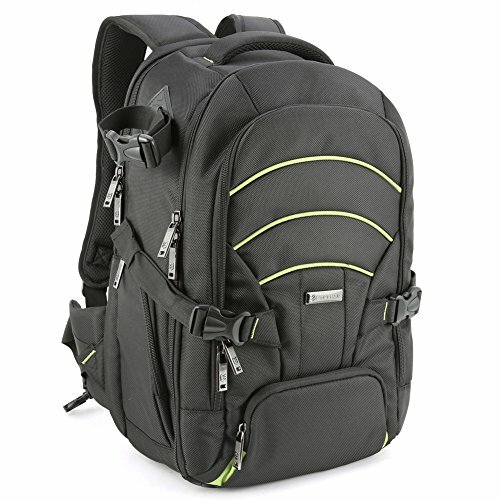 A compact backpack choice is this effort from Beaspire. It doesn’t have the laptop sleeve – but then you’re not really buying it for that, are you? You can adapt the interior of the bag to suit your needs, even removing the padding completely should you just require a standard backpack. Detachable waist and sternum straps ensure it stays in place when you’re on the move. Tripod pocket helps keep the weight distributed. Might just have too many distracting clips, zippers, and fastenings. A decent all-round camera bag for the budding amateur. It’s a little bit busy for my tastes though. Here’s something a little different with this stylish waterproof canvas bag from Zecti. 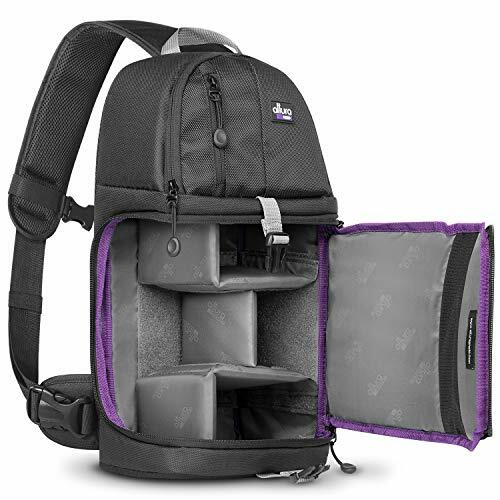 The camera compartment is at the bottom of the bag, where you can store any combination of up to four of your chosen lenses. The top compartment is suitable as space for extra clothing or other gear, and the whole package is well weighted with solid straps and breathable back materials. Waterproof, but a rain cover is included. Canvas design not everyone’s cup of tea. A little fiddly accessing the equipment for some. This eye-catching bag makes a nice change to the usual camera backpacks out there, but it’s all a matter of taste. I personally think it’s super-smart with great functionality, but some might think there’s too much going on for a camera bag though. Now, this offering from Beschoi does exactly what it says on the tin. It’s a camera backpack – no messing! 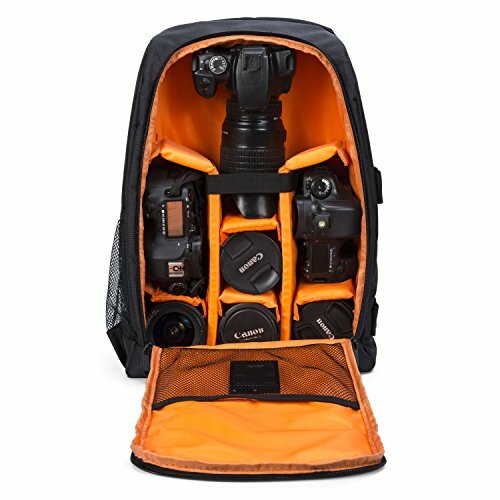 It can hold up to two DSLR cameras and up to 6 lenses in the single main compartment – which is super easy to access. There’s also a laptop sleeve for devices up to 14 inches. Made from water-repellent nylon, it also boasts anti-theft zippers and reinforced stitching. You can also remove the internal padding should you want to use it as a daypack. No room for any other gear. If you’re looking for a basic camera backpack for hiking look no further. It won’t stand up to a lot of water though – so invest in a rain cover or risk the consequences. They make great cameras, but do they make great camera backpacks? You’d expect so coming from one of the world’s leading camera manufacturers. It’s made from a waterproofed material with the main compartment capable of holding up to 2 cameras and 4 lenses. In an unusual move, the tripod straps are on the bottom of the pack. There’s a handy drawstring section on the front to maybe stuff some extra clothing or other gear. It’s obvious it’s a camera bag. Only marketed at Canon users? Canon knows a thing or two about cameras so they know how to store them safely. This is a great option at an agreeable price – but would a Nikon die-hard be seen dead with it?! Speaking of Nikon, I couldn’t let Canon have an entry without researching a bag from their biggest rival. This is a super compact design that can still hold up to 5 lenses and up to 2 DSLRs with flash accessories and other equipment. Solidly built, tear-resistant construction with comfortable straps and sternum harness. Like the Canon – it’s obvious it’s a camera bag. Unclear how waterproof it is. 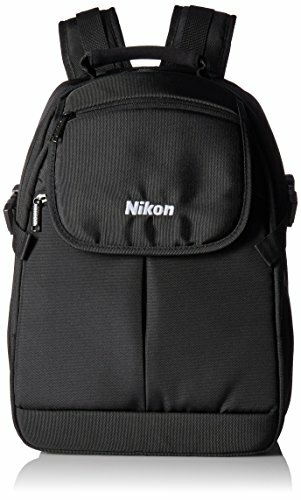 Fellow camera stalwarts Nikon offer a great backpack, continuing to rival their competitor. This is super smart, practical and professional, but again – I doubt you’d see Canon users buying it! Still, this is one of my top picks. 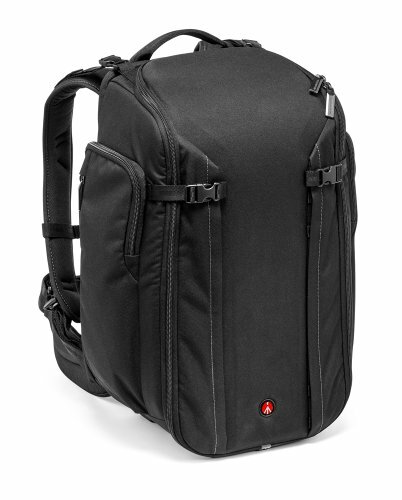 We’re starting to get really serious now with this practical camera bag from Evecase. 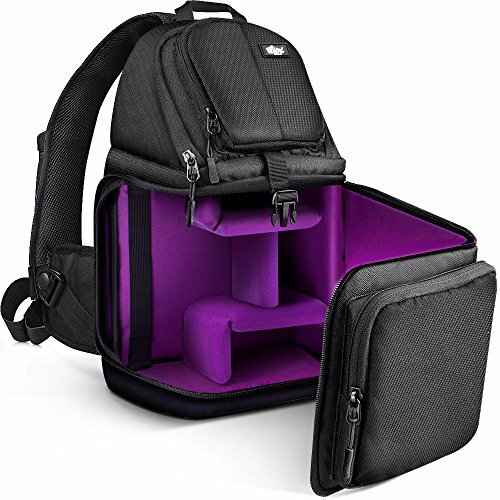 It can hold up to 2 DSLRs and 2-5 lenses, as well as a sleeve for laptops or notepads up to 15 inches. There are loads of other features including a rain cover, luggage strap, and exterior water bottle holder. Looks a little on the bulky side. 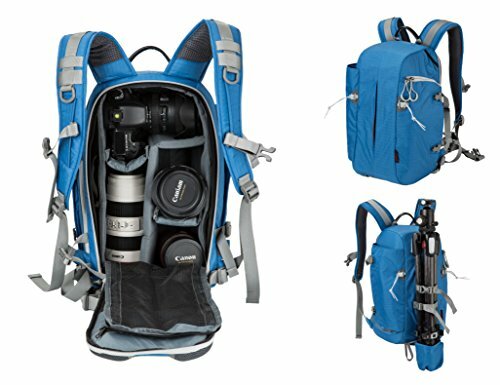 A straightforward, easy-to-use camera backpack that should keep most budding photographers happy. I’m not overly impressed with the style though. 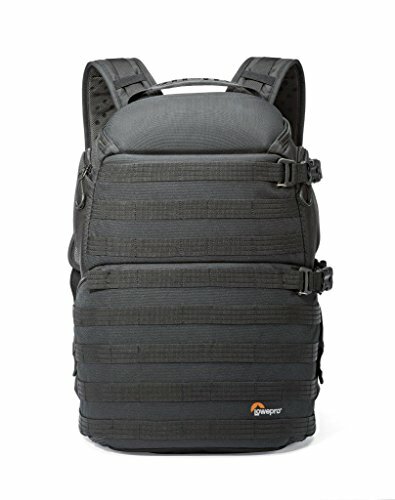 It was a matter of time before carry case specialists Lowepro showed up on the list, and this is the first of a few entries they have here. The Californian based company are known for their quality camera cases, and the hatchback does not disappoint. It’ll hold a DSLR and up to 3 extra lenses. It’s a super-cool, slim-line design with a really unique, discreet way of packing your equipment in a removable padded box. Might be a little on the small side for some. The only fault I can find in this pack is its size, but there is a 22-liter version available. For hiking with your camera equipment, it could well be one of the best camera bags available. 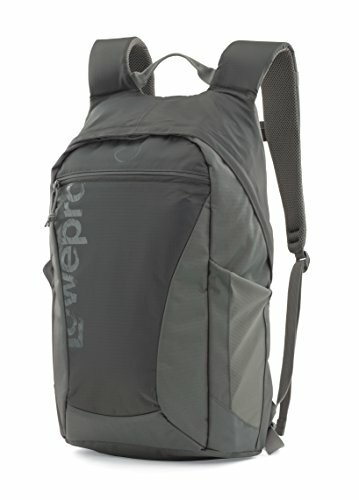 Another Lowepro entry is this Photo Sport bag – one of the most popular hiking packs on the market. Designed with hikers specifically in mind, it incorporates a day-pack compartment to hold non-camera related gear. There’s also a hydration system – which is pretty rare for these kinds of products. Hip belt and rain cover included. Super easy access with no need to put the pack down. A little small for larger lenses. This is a cracking option for hiking photographers – or photographer hikers. Either way, it’s intentionally designed to cater to both pursuits, and might be the most complete product in this review. Made from weather resistant Cordura nylon, this backpack is very customizable. You can rearrange the padded internal compartments to suit your needs and it’s a seriously pro piece of kit. Shock resistant construction protects your gear from any moderate bumps or knocks. 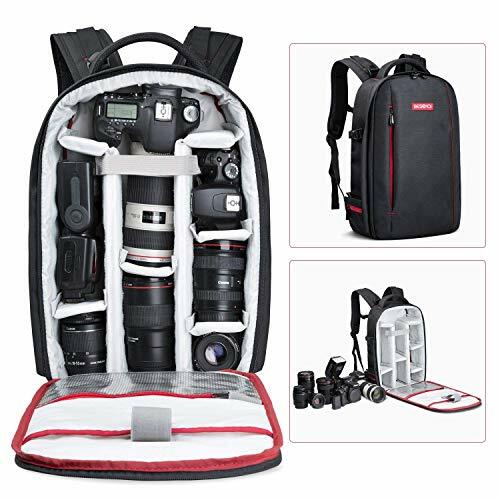 Can be unzipped quickly to access loads of gear – up to 2 DSLRs and 5 lenses, with a 15″ laptop thrown in for good measure. This is an ideal choice for the professional or top-end amateur photographer. Yet another Lowepro pick (the last one – I promise) is arguably their best. It’s a military style design that wouldn’t look out of place on a Navy Seal. It can pack a whopping 8 lenses as well as 1-2 DSLRs. Not only that, it’ll hold a 15” laptop and all the trimmings – including a drone! There are far too many other features to go into here – you need to check this pack out! If you find one – tell me! Lowepro has smashed it out the park with this hiking camera bag – I can’t really find a fault. It’ll set you back a pretty penny though! 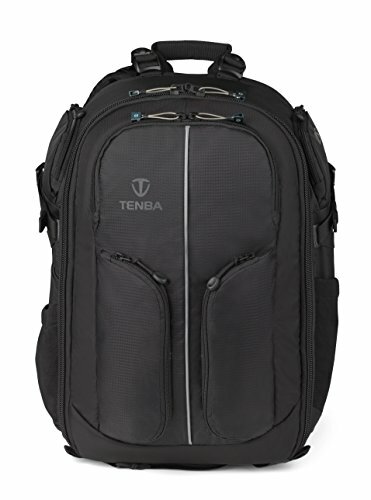 The Tenba Shootout boasts excellent harness design, well-padded and adjustable shoulder straps, and a sternum strap and hip belt. It’s definitely one of the most comfortable and sturdy designs out there. Can hold a ridiculous amount of equipment – this is another bag for the pros. Built to withstand all seasons and weather conditions. Great option if you’re carrying more gear. It’s getting to be an expensive hobby! The Tenba Shootout range is one of the best on the market for the pro photographer. Serious kids from here on only. 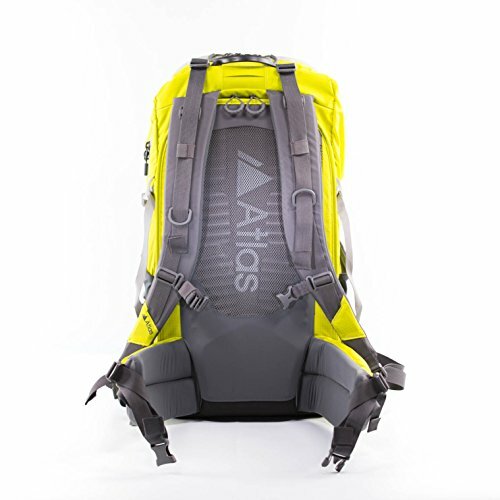 We’ve arrived at the upper echelons of camera hiking backpacks and if you fancy a serious splurge, the Atlas Athlete is the one for you. 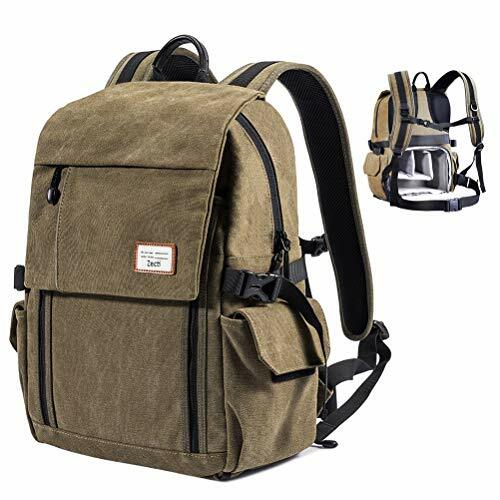 It has all the necessary features a good hiking backpack brings, along with the ability to have easy access to a studio’s worth of equipment in the front padded compartment. It’s designed to be the most versatile bag out there, and you’d never know it was a camera backpack unless I told you! Ticks all the boxes for the serious hiker/photographer. You’ve guessed it – it’s exorbitantly expensive. If you’ve got cash to spare and you’re serious about this sport/art/pastime, then this is where the buck stops. But please, don’t buy this if you don’t know what an f-stop is yet. Camera bags today come with all kinds of bells and whistles to maximize the user’s experience, but it can often make choosing the right kit a bit of a head-scratcher. With that in mind, I’ve cobbled together some functions and features you might want to look out for when choosing the right product for you. Buckle up – there are lots to consider! They say you shouldn’t run before you can walk, and never was a truer word spoken than when it comes to photography. It’s easy to lose count of the sheer number of people who have bought expensive camera equipment and it’s just left gathering dust. When choosing a camera bag, seriously consider your skill level, limitations, goals, and aspirations. Don’t be one of the many who fork out hundreds of dollars only to realize that the hobby isn’t for them. This review has been all about the best hiking camera bags – predominately a backpack style – but they come in all shapes and sizes. It often boils down to personal preference, so you’ve still got a decision to make. 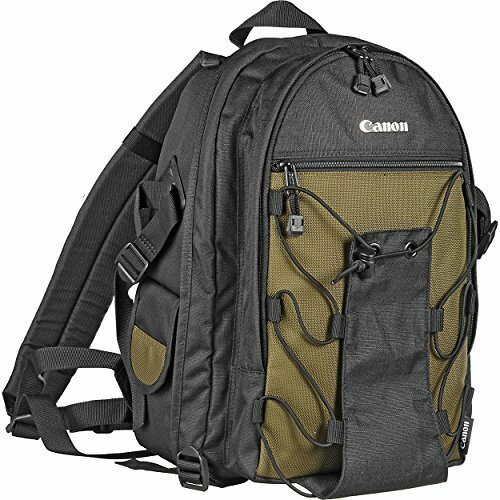 Camera bags can be carried off the shoulder, like a duffel or messenger bag style, as a backpack or with rollers like trolley luggage. They may even be a combination of all styles that each have their advantages and disadvantages. It’s up to you to decide which you prefer – or which best suits the type of photography you’re going to be perusing. Just as varied as the style is the size, and again, you want to be choosing the right tool for the job. If you’re packing multiple lenses and camera bodies, plus all the extras you need for your shoot, then you’re obviously going to need something that accommodates all your gear. Likewise, you don’t need a behemoth of a bag on your back if you’re using an iPhone and a selfie stick. Don’t forget about airline carry-on requirements either. *Disclaimer – I don’t believe luggage handlers are bored or jaded. I was using it for comic effect. Camera’s are heavy. There’s no getting around it. And when you incorporate a ton of lenses, tripods, spare batteries, and even lighting rigs, you’re potentially going to be lugging a studio around. Consider the potential weight and bulkiness of a bag including your equipment before you make a purchase. Now let’s get down to the nitty-gritty. I would say one of the primary objectives of a good camera bag is to keep all your equipment safe from the elements. The material a bag is constructed from is going to be on the front line when it comes to that protection. Canvas and leather bags each offer their own pros and cons. And at the very least, you should expect some degree of waterproofing. Even if you’re not venturing into the rainforest, you never know when the weather can turn. Water, sand, and dust will spell death to camera equipment. The best camera bags for travel will be able to keep your stuff properly sheltered from those nasty things. The inner workings of a camera bag are just as important as the external protection. Most decent bags worth their salt will come with soft foam dividers that will offer loads of storage space and options for each piece of your kit. And there isn’t a photographer alive that hasn’t missed a photo opportunity because they haven’t been able to get to their equipment fast enough. Just as valuable as the great organization is the ease of which your gear can be accessed. You certainly don’t want to be fiddling with zippers or raking through compartments the exact moment a giraffe decides to try and mate with a lion. The best camera backpack for hiking will have been built with the knowledge that you’ll potentially be carrying it around for days, weeks, months and even years. Hopefully not all at once. I’ve mentioned the weight of a pack before, and just to add a further corollary, carrying comfort is also vitally important. Traveling with camera equipment can get tiring fast, so having a bag with the right kind of support will prevent sore shoulders and dodge an emergency trip to the chiropractor. A bag that screams “I am full of expensive equipment, please steal me” is one feature you will surely want to avoid. Unfortunately, this is easier said than done, as for the most part, it’s pretty obvious when a camera bag is a camera bag. When it comes to travel and theft, apart from an open wallet full of cash, there’s little a thief likes more than a nice, juicy, camera stealing opportunity. However, many bags do come with additional security features and there are some lower-profile packs out there. Choosing something as discreet as possible might be food for thought if you’re concerned about those ever-present light fingers. It’s always nice when you purchase something for a particular job that it can also be used for something else. Having extra space or an adaptable interior can be a strong selling point for some camera bags. The opportunity to carry more than just photo equipment is a big bonus. The best camera bag for backpacking will likely offer storage options for other gear you might need on a hike, such as waterproof clothing, food, and water. There’s a lot to take in if you’re shopping for the best camera backpack for travel, but hopefully, this guide has shed a little bit of light on your search. For some extra tips and tricks, including how to pack your new gear, check out the video below. And for more info about traveling – specifically how to stay safe when you’re on the road solo, download the eBook which has loads of advice for keeping you just as protected as your camera equipment, without the need to stuff you in a padded bag. Happy shooting – and best of luck for that Pulitzer!